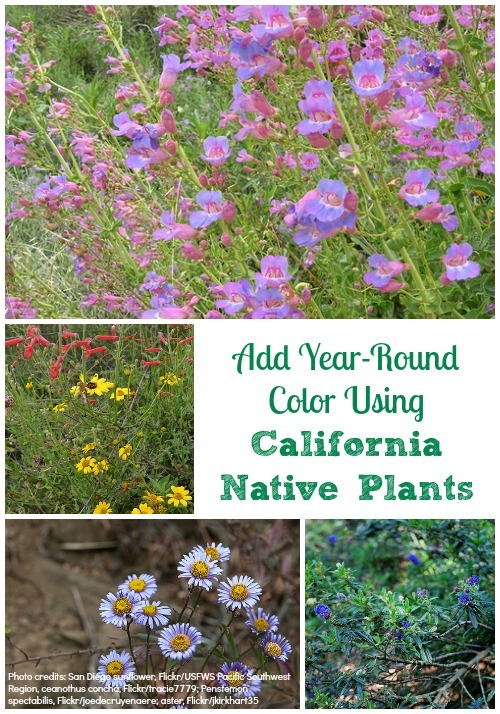 Home > Knowledge Center > Can I Add Year-Round Color to My Garden Using California Native Plants? 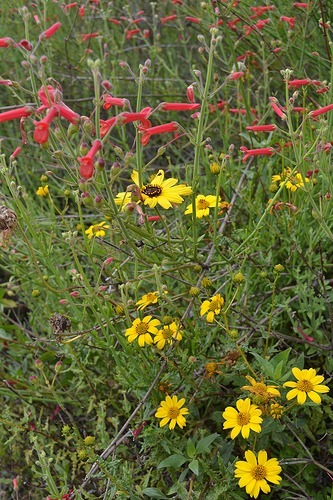 The uninhabited mountainsides and coastal areas of California may give the wrong impression in summer months as most native plants go dormant to conserve water, however, it is possible to have year-round color in a garden full of California native plants. Truth? I wish my landscape architect and design team would have addressed the benefits of using native plants in the garden during my remodel as I had the opportunity to start with a blank canvas. We’ve listed a handful of plants that will bloom in each Southern California season to give you an idea of the possibilities. The reason is simple: Native plants are already adapted to the soil and climate conditions of the habitat from which they originated. This means they may thrive in your yard with less care and without a huge need for fertilizers and soil amendments, since they’re being planted in native dirt. They, typically, have an internal resistance to local pests and because they don’t need watering beyond normal rainfall, native plants make an excellent choice for water-wise gardens and xeriscapes. California has over 5000 native plants and 30 or so biotic communities where specific plants and animals rely on each other to thrive. Most of San Diego is in the coastal sage scrub biotic community, but Las Pilitas Nursery in Escondido offers a search by zip code feature on their website to help homeowners figure this out. It isn’t nearly as beneficial to incorporate native plants from outside of your home’s biotic community because local birds, bugs and butterflies won’t gravitate toward them as much. 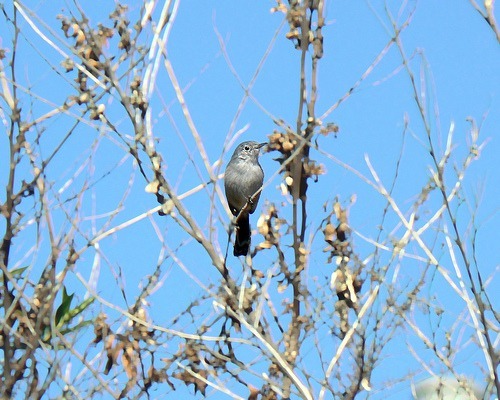 With the disappearance of natural habitats due to urban development, birds like the California Gnatcatcher that lives in dense coastal sage scrub, are threatened and a big part of the state’s conservation efforts. Known as the San Diego sunflower, this member of the aster family actually blooms from February to August and sometimes longer. The San Diego sunflower is a tolerant shrub that can handle regular watering, drought, full sun, part sun, and clay soil. 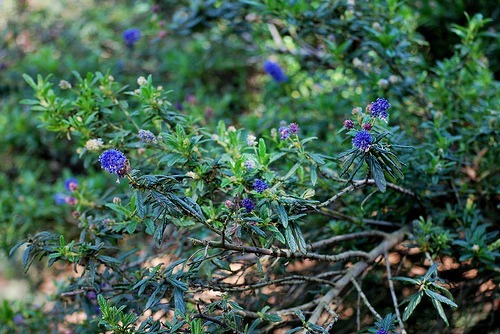 With bright blue blooms in spring, ceanothus concha (otherwise known as California mountain lilac or just California lilac) is one of the many ceanothus plants that does extremely well in Southern California. This variety grows approximately 6’x6′ and its deep roots make it an excellent choice for hillside erosion control. Expect it to live for 20-25 years. With lavender flowers blooming from April through June, this 3′ perennial can be seen growing wild on coastal bluffs in Southern California. Birds love it and it does well in clay soil. 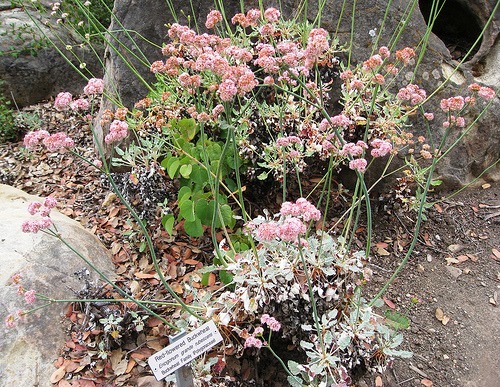 Native to the Channel Islands off the coast of Santa Barbara County and Baja California, Red Buckwheat blooms with red, white or pink flowers June through October. It’s a low-growing, mat-forming perennial herb that likes full sun near the coast and partial share inland. Though it’s rare, you can buy it at Las Pilitas Nursery in Escondido. 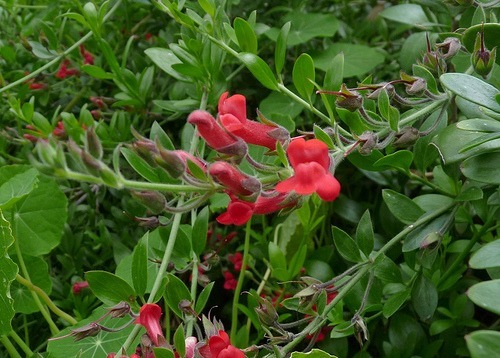 The Island Snapdragon blooms spring through fall with red flowers appearing vibrantly in the summer, too. 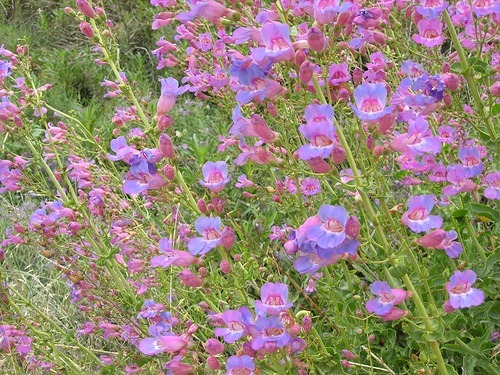 It’s a perennial that’s native to the Channel Islands and grows to about 2’x4′ tall. 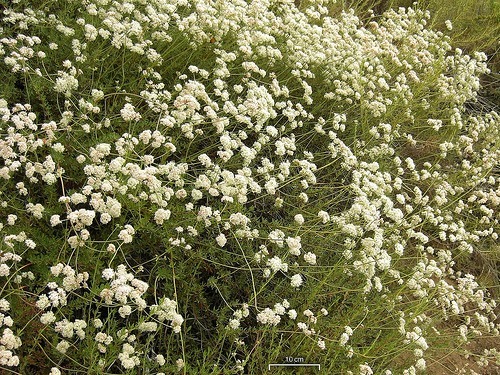 You’ll find it in coastal regions growing as a pretty ground cover. 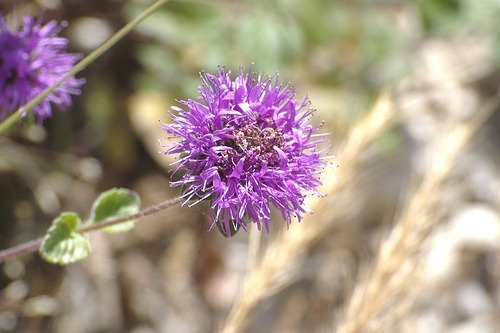 Coyote mint has pretty grey-green leaves and purple flowers all summer. It grows to about 2′ tall and can be brewed into a bitter tea. As the name implies, it does smell like mint. Butterflies love it, but deer do not. Plant in the sun for more flowers. Here is where companion planting comes into play. The California aster normally blooms in late summer, however, when planted alongside Solidago californica (California Goldenrod) and Zauschneria ‘Catalina’or Zauschneria cana the flower bed will come alive in late summer and on into winter. California buckwheat flowers constantly in winter and is commonly seen around San Diego and other parts of Southern California. It’s extremely drought-tolerant and important to the butterfly community. 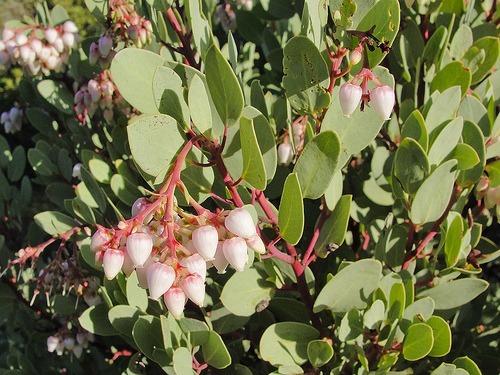 Manzanita’s red branches automatically add in a little color to any yard. Fortunately, there are many that will grow well in a coastal sage scrub community. This particular one hails from Los Angeles, hence the name, and its size varies from 1-6′ depending on whether it’s inland (taller) or by the coast (shorter). This manzanita can live to an impressive 100 years old. 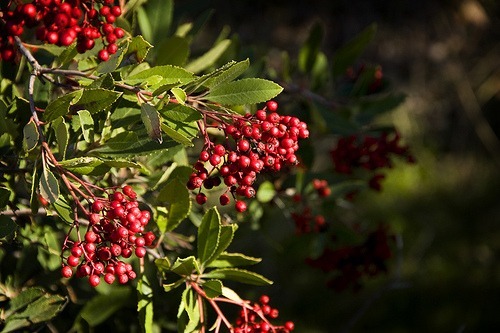 Heteromeles arbutifolia, known as Toyon or Christmas berry, provides festive fall and winter color and makes an excellent addition to any holiday arrangement. It’s a small tree that grows to about 6′ tall, usually, with old trees reaching heights of 15′. It’s drought-tolerant though can handle watering with good drainage and most sun conditions. In very large quantities, the berries can be poisonous and probably not ideal if curious kids might try them out. Native plants existed before there was human intervention and they are disappearing at what some refer to as an alarming rate due to invasive species, housing developments, agribusiness and other human activities. The disappearance of native plants is harmful to native wildlife, especially birds and butterflies. 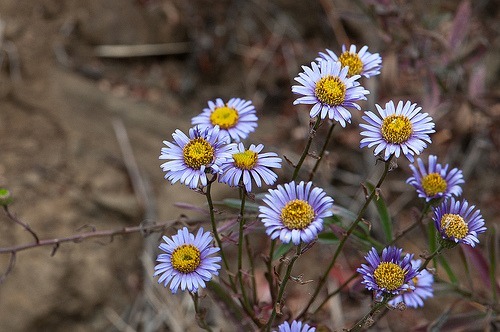 It is illegal to collect wildflower plants on public land in California without a permit as they have a low rate of survival when transplanted.